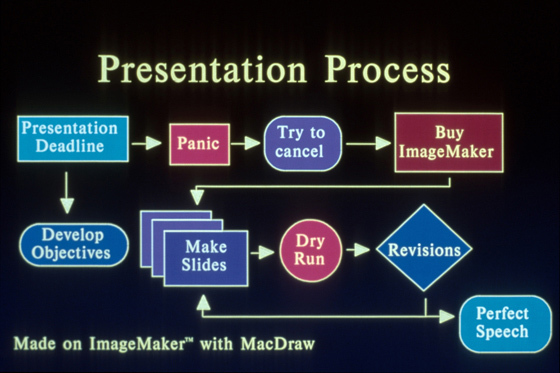 Prior to the advent of PowerPoint and video projectors, business presentations were commonly delivered using 35mm slides. The creation of these slides was usually outsourced to service bureaus who charged $50-$100 per slide to create pie charts and graphs. The bureaus, in turn, used specialized equipment that cost over $100K and required trained technicians to operate. In addition to the high cost per slide, and the multi-day turnaround, the process required a company to expose its confidential and sensitive information to a third party. Presentation Technologies, a venture capital-funded Silicon Valley startup, saw an opportunity to develop a desktop solution for creating professional quality presentation slides. At the time, several other competitors were coming to market with low cost consumer machines. 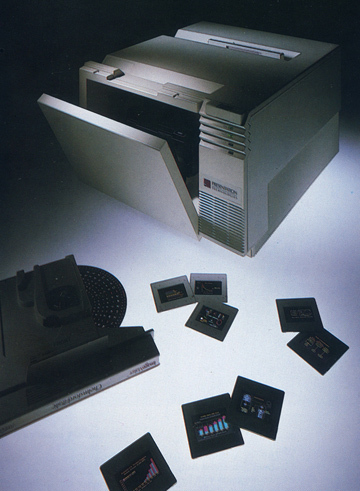 These competing machines, however, were based on low-resolution monitors, which resulted in highly pixilated images and text. 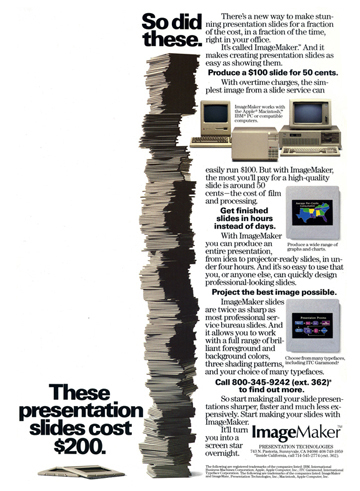 Slides from these machines were not of sufficiently high quality for professional presentations and never gained traction. 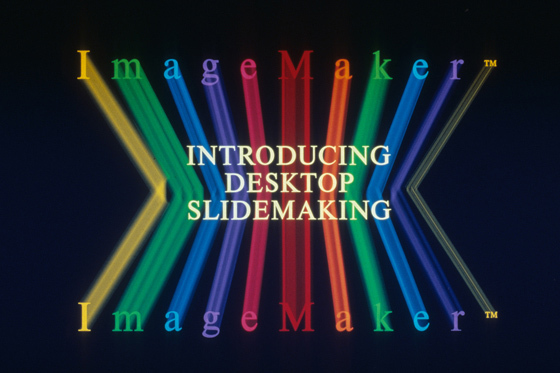 Presentation technologies teamed up with David Kelley Design (DKD) to develop its flagship product, ImageMaker. 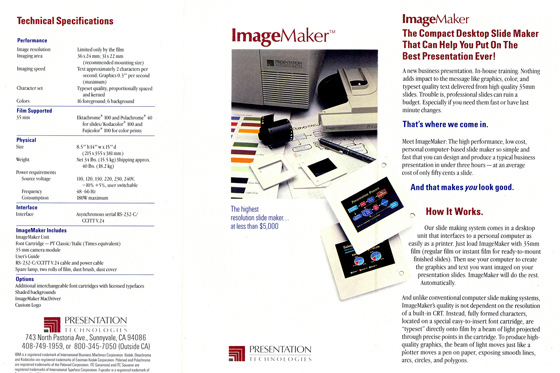 As project lead for DKD, Walt Conti led the conceptualization, prototyping, and production design of ImageMaker. The goal was to create an easy-to-use, desktop machine that could create high quality slides and retail for less than $5,000. 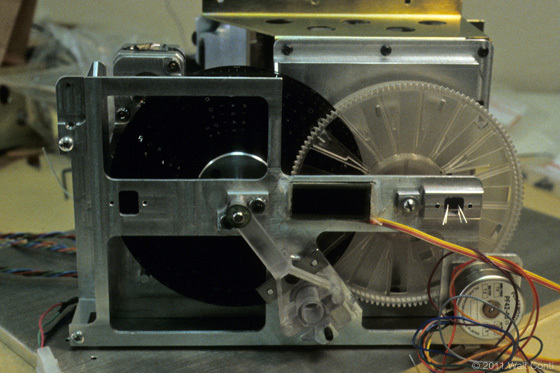 The basic concept for the machine was inspired by the daisy wheel printer (text) and the pen plotter (graphics) that were in common use at the time. In theory, this approach could produce slides of typeset quality that would be superior to any monitor-generated bureau slides, regardless of cost. However, no one had ever created a consumer desktop machine that could write and draw directly on film. 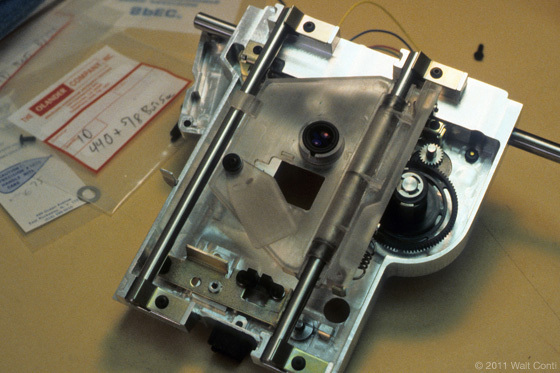 Numerous optical configurations were investigated and prototyped. 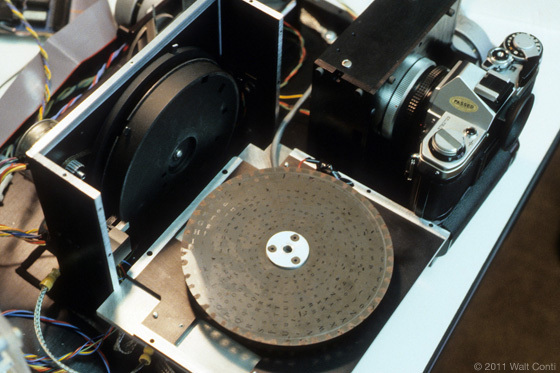 The machine had to be capable of imaging characters onto the film with an accuracy of .0001 inch, which was an order of magnitude better than what was required of then-current-day daisy wheel printers. Furthermore, creating graphics by optically drawing on film required rigorous control of the dynamics of the lens movement. In addition to end-point accuracy, any path or speed variations would be greatly amplified when the slide image was projected. 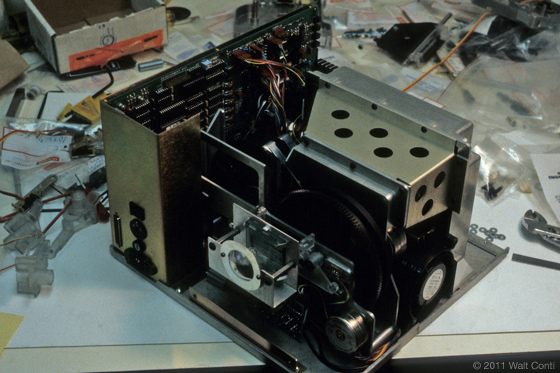 On top of the mechanical challenges, the machine had to carefully control exposure and prevent any unwanted light from leaking onto the 35mm film while the camera shutter was open, sometimes for minutes at a time. Ultimately, exposure control was achieved by using a novel and patented LCD light valve in conjunction with a mechanical capping shutter. After successfully prototyping a final configuration, the DKD team proceeded with designing the final product for mass production. In addition to overseeing the mechanical design team, Walt was directly responsible for the engineering and design of the majority of the internal mechanism. 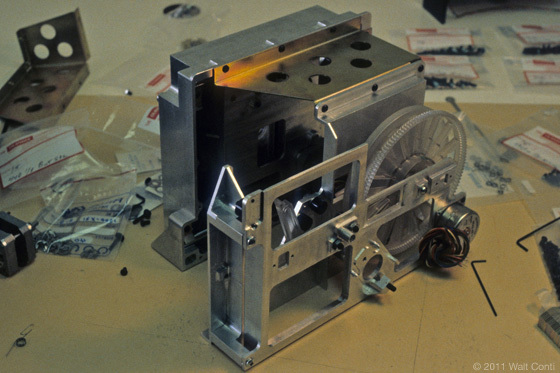 The final design incorporated numerous aluminum die-castings, as well as injection-molded components. The system had to be easy to assemble and yet maintain accurate alignment of the optical subsystems throughout the variable operating temperature of the product. 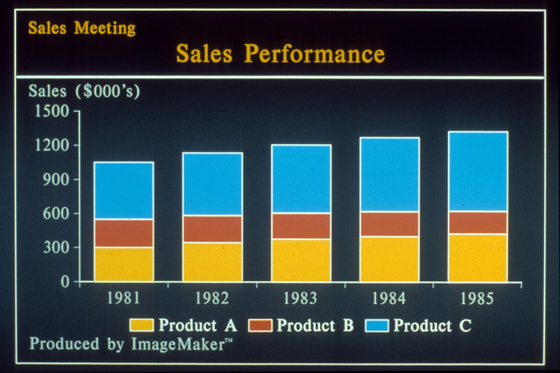 Walt and the team were granted numerous US and foreign patents for the inventions and technology inside ImageMaker. The product also won several design awards. © 2012 Walt Conti. All Rights Reserved.